This was taken two days before her death, I had gotten a new camera and need some pics of my baby! Well its basically all in the title, Maxine and me she was Maxine I was me and from July 8th, 2006- January 19th 2007 Maxine had a huge impact on my life. I had adopted her she was a young dog about two years of age. She always had to run off if I wasn't around for some darned reason apparently she thought I had left her behind and she wanted to come and find me. 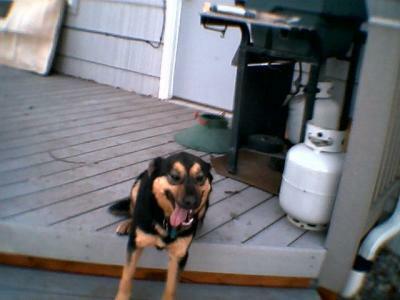 Maxine wasn't a Jack Russell Terrier she was a German Shepherd/Rottweiler cross that stole my heart on the first day. To make a long story short Maxine ran off one morning and was struck by a semi truck at 70 mph and was already dead when I got there, her head had whipped around and slammed into the bumper of the truck, killing her instantly she bounced off and landed in the ditch and didn't move again I guess. I had the vet look at her he said she had died from injuries sustained to the base of the skull sometimes called a basilar skull fracture results are usually fatal, it was just a sad day to lose her we only had her for seven months but she changed me in many ways. Maxine now romps with other dogs at the Rainbow Bridge a wonderful dog-heaven where all our pets go, a place of sunny meadows and hills the pets wait until the day comes when their owner arrives to take them to heaven never to be separated again, Maxine I will join you someday and we will cross the Rainbow Bridge together. I wish I could've been more cautious. It was pretty much my fault Maxine ran off that day, I woke up and went out to feed her like I had in the past, it was a fairly nice day the sun was shining, (but wouldn't be later) I decided, well what the heck? I let her off to run around and do her business and then take her for a walk. I should've stopped right there and taken that back. I set her food bowl down in front of her and then removed her cable (leash) that was attached to her collar, I went back into the house and looked back and saw her eating, her curly tail waving side to side, I never saw her alive again. I went in to eat breakfast and then grabbed my coat and Maxine's leash I went out and she was gone, I walked over to her bowl she had only eaten half of it. Two hours later I was wrapping her body up in a blue blanket. I could've stopped it all if I had thought about what might happen before it did. So please dog owners, if you have a dog that runs off all the time, please for Maxine's sake take extra caution with him/her when deciding if you want to let him/her run around unsupervised. Thanks for the wonderful comments they are truly appreciated. Maxine would've liked them too! Maxine always loved being appreciated by others. I didn't think about it until now, Maxine wasn't any ordinary impounded shelter dog that nobody paid attention to, she was different from my other dogs in many ways, you know the worst part of losing her was when I took her to the vet that day and I remember he took that metal thing and placed it on her heart, he then took it off and felt for a pulse and then he shook his head and said, "I hate to break this to you um but, she's dead." I remember standing there it felt like my legs had turned into rubber, and I could hardly stand straight. I remembered back to the day I first saw her up until now where I type this, that Maxine wasn't just another dog, she was part of me, and when she died, a part of me died too, I'll never forget that for as long as I live. Oh Jon I just can't tell you how sad your story has made me. There's just nothing that can replace a beloved dog. Maxine sounds like a wonderful dog. Such a loss, such a great loss. They give us so much love, it's just heartbreaking when we lose them. I cried and cried when I read this. My heart goes out to you. Our dogs are so much more than pets.